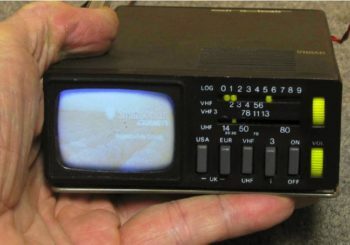 After restoring the world’s largest B&W TV, the monumental 1952 30 inch DuMont Royal Sovereign, I restored the world’s smallest TV, a 1978 2 inch Sinclair MTV-1 pocket TV. This hand-held TV, produced in England, features both European and American TV standards, an internal battery pack of 4 NiCads, and a 2-inch CRT. Can you explain me the secret of that? Hi I’m in Australia, and have 2 MTV1 Sinclair micro B&W 2” TVs both have a faulty power IC ST3 schematic reference IC401, no one can supply this IC, or provide replacement info, I cannot find a substitute or listing in any of my old books, I think it is a Texas Instruments chip with Sinclair ID stamped on it, can you please help with a supplier or substitute information, many thanks John..